A number of physiological changes take place when the respiratory system is placed under stress. There are many situations in which this can occur but in this article, we will look at the response of the respiratory system to exercise and being at altitude. During exercise, the gas exchange requirements of the lung increase, with both increased consumption of oxygen and increased production of carbon dioxide. More intense exercise also results in increased lactic acid production. For a typical person, the energy used for breathing is less than 3% of the total energy expenditure for exercise. Upon commencing exercise, there are cardiac changes- both an increase in the heart rate and stroke volume lead to an increase in cardiac output. This results in an increase in pulmonary circulation. At this time, blood flow is redistributed, with more blood being directed to the middle and upper zones (via the recruitment of more pulmonary capillaries), leading to reduced regional differences within the lung. In addition, both the respiratory rate and tidal volume increase during exercise and hence alveolar ventilation also increases. This increases gas exchange and minute volume. It is not fully understood why the rate of ventilation increases upon commencing exercise and several mechanisms are thought to be implicated. Exercise can be aerobic or anaerobic. The anaerobic threshold (AT) is a controversial term used to describe when anaerobic metabolism begins. Anaerobic metabolism increases lactic acid production and the point at which this occurs will vary with the fitness of the individual. During aerobic respiration, carbon dioxide production, minute volume and alveolar ventilation increase proportionally, resulting in a constant pCO2. However, after the AT, the minute volume and alveolar ventilation rate increase more than the CO2 production, leading to a low pCO2. Additionally, the build-up of lactic acid results in hyperventilation owing to the lactic acidosis it causes. As work increases, oxygen consumption (Vo2) increases proportionally until it plateaus- this should occur after the AT has been reached. At this point, oxygen consumption is at a maximum (it is known as VO2 max) and even though work can increase, oxygen uptake will remain at this maximum point because it is not possible to increase the cardiac output any further. This maximum point is approximately 10 times the resting oxygen consumption. In terms of the oxyhaemoglobin dissociation curve, exercise causes a right shift due to the increased body temperature, pCO2 and [H+]. This increases oxygen availability to the muscles. 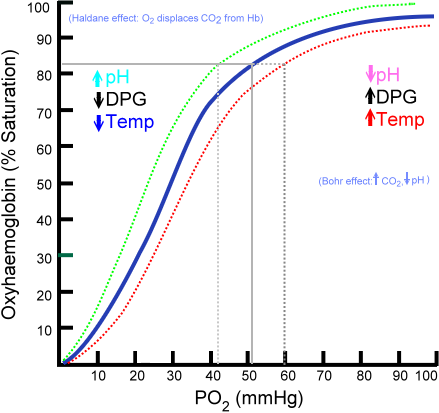 Fig 1 – The normal oxygen dissociation curve as well as the factors that shift it left or right. As altitude increases, atmospheric pressure decreases. At sea level, atmospheric pressure is approximately 760mmHg (compared with approximately 253mmHg at the peak of Mount Everest). These atmospheric pressures can be used to calculate pressure of oxygen (pO2) in air to show that the pO2 is approximately 159mmHg and 43mmHg at sea level and the summit of Mount Everest, respectively. The process of acclimatisation explains why in parts of the world such as Tibet, many generations of people have lived at high altitude whereas climbers have to take considerable care when moving to high altitude. Acclimatisation describes the normal physiological changes through which the body adapts to decreasing levels of oxygen. Hyperventilation is one of the most notable manifestations of acclimatisation. This occurs when peripheral chemoreceptors, situated in the aortic and carotid bodies, detect the falling arterial pO2 and hence increase the respiratory rate. The resultant hypocapnia and alkalosis initially prevent a further increase in respiratory rate due to it being sensed by the central chemoreceptors in the cerebrospinal fluid (CSF). However, after a few days, the pH of the CSF and arterial blood are returned to normal following a response from the CSF and kidneys involving bicarbonate ions. This therefore means that the respiration rate can continue to increase. It is also important to mention 2,3-Biphosphoglycerate (2,3-BPG). This substance is formed during glycolysis in the red blood cell. It binds to one of the beta-chains of the haemoglobin, allowing deoxygenation and a right hand shift. The respiratory alkalosis resulting from hyperventilation at altitude leads to a rise in 2,3-BPG after a couple of days. Polycythaemia is another feature of acclimatisation that is much slower to develop. It is an increase in the haematocrit which can have a number of causes. In the case of people at high altitudes the cause is an increase in the number of circulating red blood cells. In response to hypoxia, the kidney releases the hormone erythropoietin which stimulates red cell production in the bone marrow. This results in increased haemoglobin levels and hence increased capacity to carry oxygen. It is also important to note that whilst at altitudes, polycythaemia is an appropriate physiological response, it causes hyperviscosity which can become pathological. This is often made worse by ascending to very high altitudes quickly, as such the best way to avoid it is by ascending slowly and avoiding strenuous activity in the first 24 hours after ascending. In more severe cases the only reliable treatment is to descend from the altitude, however some methods such as oxygen supplementation and steroids can be used to treat the symptoms. How does the blood flow to the lungs alter during exercise? Which of these would not shift the oxygen dissociation curve to the right?